R.W.A. 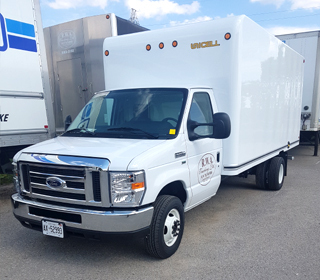 TRUCKING LTD. has been serving Southern Ontario for the past 35 years. Our Company is dedicated to all our Customer needs. We pride ourselves in having an impeccable record. Our Company performs in a speedy, efficient and courteous manner. Being on Time and up-to -date with all of our Drivers in operation, is of utmost importance in our day to day operations. All Vehicles are top of the line and very well maintained. We implement above standard maintenance programs to keep our fleet in top performance and reduce any potential problems on the road. contact us for a reference list of Service Clients. R.W.A. C.V.O.R. checks of driver's abstracts are clear of all infractions. We will only commit to as much transport moves as can be handled in the time our customers are expecting. In this industry it is very important to service all cliental with proficiency. R.W.A. Trucking Ltd., is strictly an Expediting Service. Load and Go is our Motto. With the Customer load capacity at the moment, we have room to take on more work. If you feel our Company Service would be beneficial to you, give us a call. Let's discuss the aspects of servicing your firm.